The Rev. 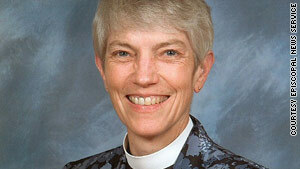 Mary Douglas Glasspool was elected bishop late Saturday by the Los Angeles Episcopal Diocese. Archbishop of Canterbury says Glasspool's election "raises very serious questions"
LOS ANGELES, California (CNN) -- Los Angeles Episcopalians elected an openly lesbian bishop late Saturday, the denomination's news service reported. The Rev. Mary Douglas Glasspool, 55, will become the first openly gay bishop in the Episcopal Church since Gene Robinson took office in New Hampshire in 2004, if she is formally approved. Conservative factions in the Anglican Communion -- a 77-million member denomination worldwide, with the Episcopal Church as its U.S. branch -- have opposed the ordination of gay bishops. The archbishop of Canterbury, the head of the Anglican Communion, issued a statement Saturday saying that Glasspool's election "raises very serious questions not just for the Episcopal Church and its place in the Anglican Communion, but for the Communion as a whole," according to the Episcopal Church's Web site. Glasspool's election is the first choice of an openly gay bishop since the church ended an agreement designed to keep the worldwide Anglican Communion from tearing itself apart. In the wake of the Robinson controversy, Episcopalians called a temporary halt to appointing any more openly gay bishops, to give the church time to hammer out a compromise. They voted this summer not to renew the ban. Glasspool, now based in Baltimore at the Diocese of Maryland, is the first openly gay candidate elected bishop since then. The Diocese of Minnesota considered an openly gay candidate for bishop in October, but chose another priest when votes were cast. Some Episcopal leaders reacted angrily to Glasspool's election. The Rev. Canon Kendall Harmon, canon theologian from the Diocese of South Carolina, said the election "represents an intransigent embrace of a pattern of life Christians throughout history and the world have rejected as against biblical teaching," according to the Episcopal Church site. Glasspool will assist Bishop Diocesan J. Jon Bruno in ministry to the Los Angeles region's 70,000 parishioners, according to that diocese's Web site. She will become one of two bishops suffragan -- the second-highest position in the clergy of the diocese -- if she is formally approved. The choice requires consent from a majority of the church's other 108 dioceses. "If by chance people are going to withhold consents because of Mary's sexuality, it would be a violation of the canons of this church," Bruno said, according to the Episcopal Church site. Glasspool also becomes the second woman bishop in the 114-year history of the diocese -- elected only hours after the first, the Rev. Diane Jardine Bruce, 53. She is the 17th woman elected as an Episcopal bishop nationwide, according to the diocese Web site. "She's not afraid of conflict and she is a reconciler," Bruno said, according to the Web site. Glasspool and her partner of 19 years are an example of loving service and ministry, he added. Her partner, Becki Sander, recently earned a doctorate in social work. Glasspool, who has been ordained a priest for 27 years, is the daughter of an Episcopal priest, the diocese said. She and Bruce were among six candidates nominated by a 24-member diocesan committee, according to the diocese. Bruce is now rector at St. Clement's by-the-Sea Episcopal Church in Southern California. Describing herself when she was nominated, she wrote: "At St. Clement's by-the-Sea, I pastor in a mixed Latino/Anglo neighborhood. Next to million-dollar homes near the beach are buildings with two or three families sharing one small apartment. We offer three services every Sunday: two in English and one in Spanish. I minister to a group ranging from the very wealthy to the very poor. I am most proud of having helped start the Peaceful Warrior Tae Kwon Do Academy for at-risk youth in the neighborhood."